Below are all homes for sale in Forest Manor subdivision, located in Indianapolis, Indiana. All active listings are updated twice per hour, every day, with data from the Metropolitan Indianapolis Board of Realtors MLS/BLC. Add any of these Forest Manor homes to your favorites, sign-up for price reduction alerts and save searches. Get Forest Manor automated home sale updates. 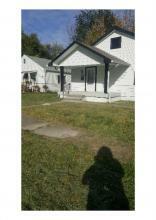 Come view this 2 bedroom, 1 bath property! This single family home has great size rooms, nice kitchen space, and great backyard space you could create your own outside fun or area to relax! Great place to make your own. Two bed, one bath Bungalow waiting for your TLC. Hardwood floors throughout most of home. Full basement. Could be a nice little rental too! 1 STORY LEVEL, BRICK HOME, MOVE IN READY; A GOOD EAST SIDE STARTER HOME FOR A SMALL FAMILY. APPLIANCES ARE NEGOTIABLE.